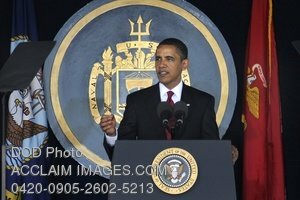 Description: President Barack H. Obama deliveres the commencement address to the near 1,040 graduates and an estimated audience of 27,000 friends and family at the Class of 2009 graduation and commissioning ceremony at Navy-Marine Corps Stadium in Annapolis, Md., May 22. U.S. Air Force photo by Tech. Sgt. Larry Simmons. Stock photography by Department of Defense Public Domain.